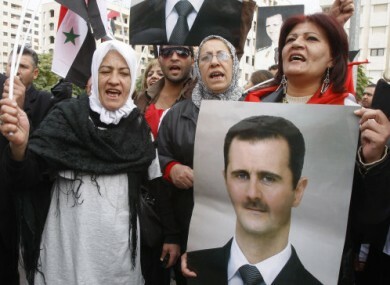 Supporters of President Assad gather outside the Syrian foreign ministry in Damascus yesterday. UP TO 90 PEOPLE are reported to have been killed in renewed clashes between Syrian security forces and civilians, while dozens of those include soldiers killed in an apparent ambush by army defectors. The UN said earlier this month that it estimates 3,500 people have been killed since anti-regime protests began in mid-March. November is set to be the bloodiest month of the conflict yet, with more than 300 people killed this month. Rami Abdul-Rahman of the British-based Syrian Observatory for Human Rights said that 34 soldiers were killed in an ambush in Daraa, where the Syrian uprising began earlier this year. Some demonstrators appear to be turning away from what have been largely peaceful demonstrations calling for President Assad’s resignation and are instead taking up arms. Yesterday, Jordan’s King Abdullah II said he believed Assad should step down in the interest of Syria, while today Turkish Prime Minister Tayyip Erdogan said it no longer had confidence in Assad’s regime. Relations between Syria and Turkey soured further over the weekend after its diplomatic mission in Damascus was attacked. It subsequently evacuated its diplomatic staff. Moscow has indicated it still supports the Syrian government. Robert M Danin of the Council on Foreign Relations writes today that although the Arab League’s decision to suspend Syria’s membership will increase pressure on Assad, it will not force him out just yet and that more extreme violence against civilians is likely in the coming weeks. Email “November set to be Syria's bloodiest month as dozens more die in clashes”. Feedback on “November set to be Syria's bloodiest month as dozens more die in clashes”.